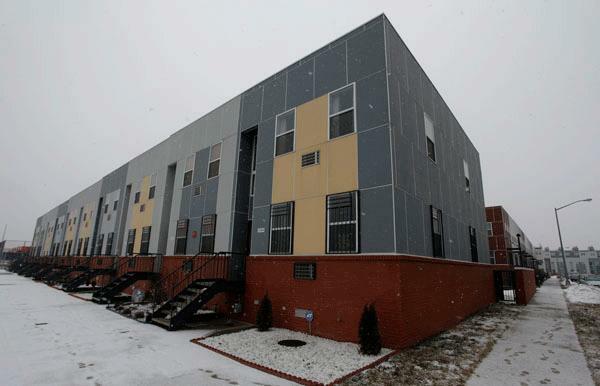 New housing in East New York has put housing ownership within reach for hundreds of working-class families. Eighty years ago, the land along East New York’s southeastern border, now known as Spring Creek, was where the city came to an end. When people fleeing the tenements built houses in an area of East New York called New Lots, when they grew vegetables on the empty land next door and watched government paving crews lay down Linden Boulevard, Spring Creek was the land beyond that. It was the scrubby turf where their teenagers played sandlot baseball, the forbidding tall grass where the ill-intentioned stashed stolen cars, or worse. It was all this, in short, because Spring Creek was a part of Brooklyn that nobody wanted—well past the end of any subway line and miles from the Manhattan skyscrapers that were sometimes visible in the distance. But over the years, the city spread out. As East New York filled up, land in Spring Creek was there, cheap and available, to handle the overflow. In one corner, a street grid developed around Flatlands Avenue. Public housing projects followed in the 1950s, and in 1974 came the vast subsidized rental complex at Starrett City. By the Belt Parkway, in 2002, came the Gateway Center Mall. Large swaths, though, remained untouched. And in the city’s lowest years, when drugs and guns threatened to drag poor places underwater, it seemed that the fringes of Spring Creek might stay empty forever. After all, the rest of East New York, long a bastion for the working class, itself felt hollowed out. By the 1980s, the neighborhood’s residents picked their way home through blocks of vacant buildings that were burned out, stripped or simply left to crumble. This is the East New York that lingers in the city’s imagination. As Brooklyn surged over the past decade, as Flatbush Avenue and Fourth Avenue saw construction of tower after tower, and as former factories of all kinds (the Toy Factory Lofts, the Chocolate Factory condos) filled with bright-eyed young artists and professionals—somehow the image of East New York never changed in the public mind. As far as it was from Manhattan, it was further still—in the collective imagination anyway—from the new Brooklyn. But something new was happening there too—a dozen L-train stops past Williamsburg’s most intrepid hipsters. East New York, a half-century ago a neighborhood of immigrants and blue-collar commuters, was growing back into just that again. Since the early 1980s, on thousands of acres of vacant land, groups like East Brooklyn Congregations have built more than 3,000 new affordable houses for local buyers. The empty core of East New York has, essentially, filled back up. All across uncool Brooklyn, in fact, neighborhoods have been regenerating. Some, like East New York and Bushwick, have come a long way back from disaster. Meanwhile, other neighborhoods far from Brooklyn’s trendier zones, like middle-class Bensonhurst and Bay Ridge, have maintained their prosperity while undergoing dramatic yet largely peaceful ethnic shifts. These places, and neighborhoods like them, are not the Brooklyn for which David Beckham’s child is named. They aren’t the Brooklyn electrified by upwardly mobile newcomers or abandoned by industry, but they are where most of the borough’s 2.6 million residents actually live. They are places where the story of the new Brooklyn is different. The story in Spring Creek is that on land that was empty throughout the city’s history, someone is building houses. Driving down Flatlands Avenue now, along what used to be the neighborhood’s fringe, the change is unmistakable. Fresh streets stretch out to the south, lined with new sidewalks and streetlights. Behind construction fences, workers are busy: They are putting up a building that will hold two new schools, to go with the 1,200 units of owner-occupied housing that are being built around it. The development is part of the Nehemiah Homes, the longterm neighborhood redevelopment project of East Brooklyn Congregations, a community organization made up of 32 schools, neighborhood associations and houses of worship. The group has been building housing on vacant land in East New York, Brownsville, Bedford-Stuyvesant and Bushwick since the 1980s—first in the interior of the neighborhoods and now, with most of that land filled in, on the edge. At the Spring Creek development, one-bedroom attached houses start at $172,500, with three-bedroom attached units going for as much as $499,000. The waiting list, says Grant Lindsay, an organizer with the group, is long. Looking to the left, they would have seen the towering Samuel J. Tilden Houses, an eight-building public housing complex that, residents say, even police were hesitant to enter. There were many residents inside and outside the projects who wanted a better place to live, Lindsay says. But if the city had redeveloped the empty land itself, it probably would have built more high-density rental housing. The Nehemiah concept, on the other hand, called for single-family houses assembled at the Brooklyn Navy Yard to be trucked into the neighborhood and installed for approved buyers. The city would donate the land and provide infrastructure, and East Brooklyn Congregations would cover most construction costs and handle the sales. One condition of sale: All residents would have to join a homeowners’ association. Skepticism was high, not least among the neighborhood’s residents. Twenty-five years later, her sons have grown up and moved away, but Goffe, 62, and retired, still owns the house. Her neighbors include bank workers, city workers, nurses and businesspeople. The neighborhood is no paradise—the Tilden Houses are still forbidding—but she says there are hopeful signs, like the arrival of chain stores on Pitkin Avenue. Goffe, who is on the board of the homeowners’ association, says early doubts have been proved wrong. Eastern Brooklyn, city crime statistics show, has indeed grown safer. Since 1990—the year that murders citywide peaked at 2,262—killings in the two police precincts covering East New York, Brownsville and the surrounding neighborhoods combined have declined by almost two-thirds, though the improvement has not kept pace with the citywide decline in murders of 76 percent over the same period. Meanwhile, East New York’s population has swelled. According to an analysis by the Center for the Study of Brooklyn at Brooklyn College, the population of the neighborhood’s community district grew almost 17 percent from 1990 to 2008. The median household income, adjusted for inflation, actually declined slightly over those decades, and the poverty rate stayed level at around 30 percent (compared with Brooklyn’s overall poverty rate of 22.4 percent in 2008), but the percentage of residents over 25 with a bachelor’s degree or higher rose from 6.5 to 13.7, while the percentage of residents without a high school diploma was cut in half. The changes are subtle enough that, on bad days, they can be hard to see. But Lindsay insists they are there. A few years ago, as residents of one Brownsville building met to discuss the things that would improve the property, a gunfight broke out in an adjacent courtyard. One thing that has not changed about East New York, at least in the few decades since white residents abandoned it for the suburbs and Staten Island, is race. As it was in 1990, the community district today is roughly half black. But other Brooklyn neighborhoods have seen stark demographic shifts. “For the past 10 years, it’s been quite dizzying,” says Jerry Krase of Brooklyn College. During that time, he says, Russians have taken over many of the businesses on 18th Avenue—also known as Cristoforo Colombo Boulevard—in the longtime Italian stronghold of Bensonhurst. Middle Easterners have made their mark on Bay Ridge. And Chinese immigrants, starting from a foothold in Sunset Park, have expanded into several surrounding neighborhoods. The Center for the Study of Brooklyn’s numbers, derived from the Census, are dramatic: In 1990, the language other than English spoken by most people in Bensonhurst was Italian. By 2008, it was Chinese, followed by Russian, with Italian a distant fourth. The percentage of residents who don’t speak English at all doubled, to more than 26 percent. In the neighborhood’s community district and in the district to the west that encompasses the neighborhoods of Bay Ridge and Dyker Heights, the population of residents with Asian ancestry has more than tripled. In both districts, the second most common place of birth, behind New York state, is China. But the change has come, the numbers indicate, without a corresponding socioeconomic shift. In both districts, inflationadjusted household incomes have remained stable since 1990, and poverty rates have stayed low. John Mollenkopf, director of the Center for Urban Research at the City University of New York, says the scene is one that has played out, with slight variations, across much of Brooklyn: the descendants of the last great wave of migration gradually giving way to the next great wave. A few blocks down the avenue, 20-year-old Danny Lanno is working in his family’s store, the Cristoforo Colombo Bakery. He grew up in the neighborhood, he says, and the change has come quickly. It started, he says, when Italian people moved en masse to Staten Island and New Jersey. The result, as Chinese people filled the void, has been jarring. “Everyone is kind of, not pissed, but they’re surprised. You know: Where did all the Italians go?” he says. “I feel like the only Italians are the old people. And I feel like once they’re gone, I don’t know if there’s going to be any Italians left.” Lanno says he plans to stay in Brooklyn forever—though not necessarily in Bensonhurst. As for the bakery, he says, business is good; Chinese people come in to buy bread too. Chung’s group started in 2002 in response to violence and harassment of Asian students in local high schools. Since then, he says, the problems have faded. The Italians who remain in the area, he says, are friendly. As for the local Chinese, he says, recent immigrants need education in American culture, while the more established members of the community are beginning to get involved in local government and politics. As encouraging as the area’s largely peaceful neighborhood transitions can seem, they are not without downsides. Ethnic succession affirms the city’s openness to newcomers, researchers say, but it can also exacerbate racial segregation. Some ethnic groups, Krase suggests, have been attracted to neighborhoods like Bensonhurst in part because of their middle-class status—and their relatively low black populations. “Some of the newer groups don’t want to live in black neighborhoods, so they don’t go there,” he says. In Bensonhurst, the next change may already be under way. In a drive to promote last year’s census, Chung’s group printed a set of fliers aimed at reaching some of the neighborhood’s newest arrivals, who so far have no civic group of their own. The fliers, he says, were in Spanish. In Spring Creek, the opportunity for development has always been there, but the land was just too far from shopping or transit. East Brooklyn Congregations hopes to change that. The group has plans for a supermarket on the site and is pressing the transit authority for bus lines nearby. Until those services arrive, the neighborhood’s downsides remain. But the longfallow land is attractive anyway—in part because it is cheap, which makes for low housing costs. As the rest of Brooklyn becomes more expensive, East New York’s population is surging as poorer residents are forced eastward. She heard talk of development in the ’90s, she says, and signed on to the waiting list, and years later got a letter saying she was approved. She delayed retirement for two years until her sale was final, and she moved into her new house, where she lives with her husband and son, in the summer of 2009. The garbage and tall weeds are long gone, of course, just as the sprawling blocks of boarded-up houses are gone from the rest of the neighborhood. In their place, on the edge of the city, is Boyce’s three-bedroom house. The Nehemiah program has its critics, who argue that low-density housing is an inefficient use of land in a crowded metropolis. Others say the emphasis on homeownership and the program’s tight screening of potential buyers leave out many of the people in the community who are most in need of housing assistance. But Nehemiah residents say the program’s strict rules have a clear upside: Their developments have been remarkably stable and free of foreclosures, even in the recent years’ economic collapse, when neighboring areas, like Canarsie, were among the worst-hit places in the city. On Sunday Mayor-elect Bill de Blasio named a black man to be his corporation counsel. Will that quell concerns about the diversity of the incoming administration? In the final chapter of City Limits&apos; “Brooklyn: The Borough Behind The Brand,” a look at whether recent economic and demographic changes have altered the fundamental character of the place. From Neil Simon to Spike Lee and the Dodgers to Jay-Z, Brooklyn has long enjoyed an international reputation. The new issue of City Limits magazine looks at how that rep matches reality.